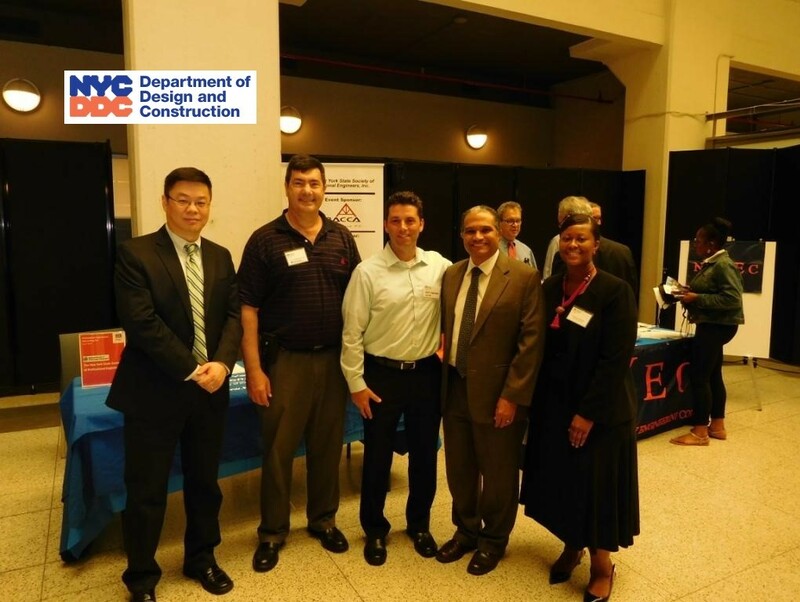 NYC DDC Commissioner, Dr. Feniosky Peña-Mora and Executive Director Dalela Harrison, met with NYSSPE Vice Presidents, Dave Macedonio PE and Rudi Sherbansky PE at DDC’s June 2016 networking fair for City engineers and employees in design and construction, as well as construction management. The importance of PE licensure at DDC, as well as continuing education opportunities for DDC engineers were discussed with the Commissioner. In addition, DDC provided NYSSPE with a list of open positions at DDC for qualified professional engineers. Among the 20+ open positions for PEs, the positions of Deputy Director, Executive Director, Program Executive, Project Executive, Administrative Engineer and Administrative Project Manager are available. Salaries range from $48,000 to $152000. Click here to see available PE jobs at DDC. DDC is looking for professional engineers to oversee and administer capital construction programs, including sewer, water main and roadway projects, planning and monitoring projects, administration of design, renovation and construction of public facilities, monitoring the life-cycle of projects, collaboration with other City agencies, performing funding analysis, risk analysis and scheduling reports, and oversight of consultant produced master plans. Projects include pedestrian bridges, step streets, retaining walls, public buildings and roadways from initiation through design and construction completion. The goal of DDC’s professional organizations and networking fair was to promote professional organizations as partners in DDC’s staff development efforts and to provide industry networking opportunities for DDC employees. Among others, the Electrical Engineering Society (IEEE) and the American Institute of Architects (AIA) were present at the fair as well. NYS Society of Professional Engineers was represented by Regional Vice Presidents Rudi O. Sherbansky PE and Dave Macedonio PE to provide information about the society. The event was held indoors in DDC’s headquarters in Queens, NY on June 17th, 2016. Prior to being appointed as DDC’s commissioner in April 2014, Dr. Peña-Mora was a Professor of Civil Engineering and Engineering Mechanics, Professor of Earth and Environmental Engineering and Professor of Computer Science at Columbia University. He formerly served as the Dean of the Fu Foundation School of Engineering and Applied Sciences. Previously, he was an Associate Professor at the University of Illinois at Urbana-Champaign. Before joining the faculty at Illinois, Dr. Peña-Mora was an Associate Professor at the Massachusetts Institute of Technology, where he earned his Master of Science and Doctor of Science degrees in civil engineering in 1991 and 1994, respectively. Commissioner Peña-Mora was the chief information technology consultant on the Boston Central Artery Third Harbor Tunnel Project, where he focused on information technology support for change management and process integration during the design and construction phases of the $14.8 billion, two-decades long engineering endeavor. He is the author or co-author of more than 200 scholarly publications and holds several patents.